The world soccer body has decreed that the West Bank is just land without teams for teams without a land. For Palestinians across the globe, May 15 marked “The Nakba,” loosely translated as the “the catastrophe.” This is the day to memorialize the 1948 mass displacement of 700,000 Palestinians and the eradication of hundreds of towns and villages, which laid the groundwork for the founding of the state of Israel. If nothing else, it is a day to reckon with the price of “erasure,” the erasing not only of a physical Palestinian presence, but of history, culture, and voices. This erasure was a precondition for the oft cited phrase by Israeli nationalists that this part of the Middle East, before 1948, was “A land without a people for a people without a land”; an abandoned meal only in search of an appetite. It is cruelly fitting that during this painful time of remembrance, another kind of Palestinian silencing was taking place in the world of sports, this time at the behest of FIFA, the world governing body for soccer. At a meeting of the 199 person FIFA congress, set in the appropriately undemocratic environs of the US client state of Bahrain, the Palestinian Football Association, was denied a vote—after years of delays—to expel six Israeli Football League clubs that play on illegal settlements in the West Bank. These teams, from their stadiums to their offices, have been built on land that has been officially recognized by both FIFA, the Fourth Geneva Convention, and the Secretary General of the United Nations as Palestinian territory. The presence of these clubs, in addition to being a rather brazen effort to use soccer as a tool to solidify illegal settlements, also mocks FIFA rules, which state that no federation can play in the territories of another without permission. To put it mildly, the Palestinian Federation has granted no such permission. There is also very recent precedent for FIFA to act in favor of those occupied. In 2014, UEFA, FIFA’s European body, blocked Russia from incorporating teams from Crimea into its national league, after Russia’s annexation earlier that year. 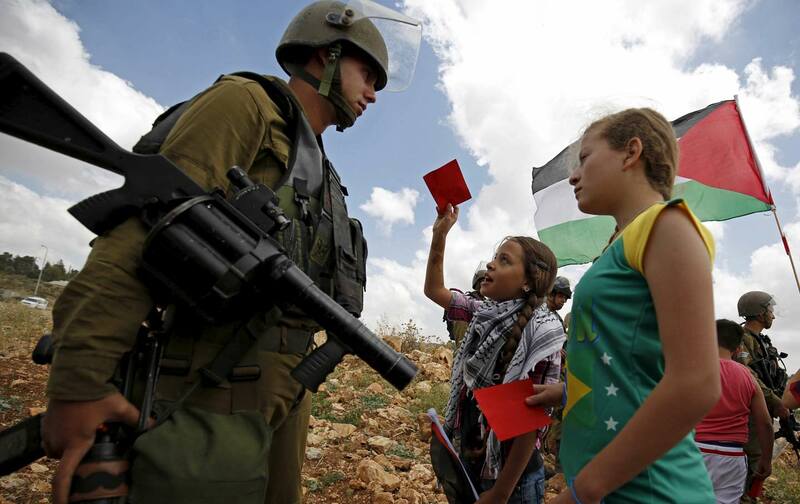 Yet for Palestinians, the FIFA by-laws did not deliver justice only more delays. FIFA President Gianni “Johnny Baby” Infantino intervened and the vote was tabled and relegated to a much more conservative sub-committee of 31 FIFA members that can take until March 2018 before reaching a decision. The vote-block by Infantino was particularly brutal because it came after a FIFA monitoring committee, following years of delays and an international activist campaign, finally produced a draft that would have empowered the 199 person FIFA Congress to vote up or down on giving the settlement teams six months to disband. If they refused, the entire Israel Football Association would have been kicked out of FIFA and denied a place in World Cup qualifiers or any international competitions. Adding insult to injury, Infantino’s power move came after Israeli Prime Minister Benjamin Netanyahu called to personally request this delay, a political intervention into the affairs of FIFA, which alone – again, according to FIFA’s own bylaws — could be grounds for suspension of the entire Israeli federation. And yet, Rajoub was too hopeful. Now we know that Infantino heeded Nethanyahi’s wishes, effectively doing the bidding of both the Israeli government and more importantly the United States. It is worth recalling that the previous head of FIFA, Sepp Blatter was only ousted from power after the legal intervention of the United States Attorney General Loretta Lynch. As noxious as Sepp Blatter was – and words can not describe the odious fumes that still linger from his tenure – Infantino knows that he owes his power to the USA. It’s not only FIFA that follows its own rules, independent of international law or norms. It’s the state of Israel as well.